South of the Canal Belt you can find one of the most vibrant areas of Amsterdam, De Pijp. This formerly working-class neighborhood is home to a multicultural community with many trendy restaurants, Brown cafés and Amsterdam’s most famous open air market, the ‘Albert Cuypmarkt’. De Pijp area was built to ease the overpopulated ‘Jordaan’ district in the 19th century. Nowadays it is the home for students, artists, families, young and old people and a melting pot of cultures and nationalities. This cosmopolitan area is often referred to as the “Quartier Latin” of Amsterdam. Most of the streets in De Pijp are named after Dutch painters except for the South-East area ‘Diamantbuurt’, which are mentioned to gemstones. The oldest explanation about the name is that ‘De Pijp’ district is named after the narrow, long and straight streets that run parallel to each other. Every morning when the locals are going into the city center through these narrow streets (pipes), it looks like a smoky cloud that explodes when they go into town. 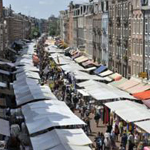 The ‘Albert Cuypmarkt’ is the most famous market in The Netherlands. This daily market offers its wares for over a century! The vendors (more than 300 stalls) sell almost everything; cheese, fresh seafood, meat, fruit but also jewelry, clothes and flowers for example. De Pijp is also popular for its trendy bars, Brown Cafés and ethnic restaurants with authentic Surinamese and Moroccan cuisine. You can find most of these hotspots on the ‘Marie Heinekenplein’ (square) and ‘Gerard Douplein’. Some fancy restaurants and cafés are: ‘De Bazaar’, ‘Barça’, ‘Mamouche’, ‘Het Paardje’ and ‘Chocolate bar’. 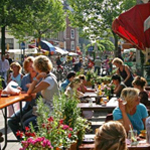 The ‘Albert Cuypmarkt’ is a great shopping experience, but there are even more shops in ‘de Pijp’ worth to visit. For example the famous ‘Blond’ store if you are looking for colored dishware. Another great shop for cooking enthusiasts is ‘Duikelman’. 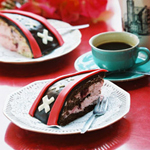 Or visit ‘De Taart van mijn Tante’; a Valhalla for cake lovers! The former Heineken Brewery, where the beer was brewed for a 100 years, has been transformed into an interactive experience; a tour through the dynamic world of Heineken. It is a great experience to learn a bit more about the history of this famous brewery. And of course drink a Heineken Beer yourself at the end of the tour. This small park in the middle of De Pijp is one of the nicest parks in Amsterdam. The park itself has not many big trees, but the large pond gives the park a relaxed atmosphere. In the park is a small fenced playground which makes it an ideal place for small children.